'The Cottage' at Bodilly Vean Farm is a newly refurbished cottage that has been completed to a high specification. The Cottage is only a 5 minute drive from Poldark Mine - one of the jewels in the crown of The Cornish Mining World Heritage Landscape, where you can explore the labyrinth of tunnels and caverns of 'Wheal Roots' - a 300 year old mine, which was used as the filming location for all the underground scenes in the recent television series of Winston Graham's 'Poldark'. 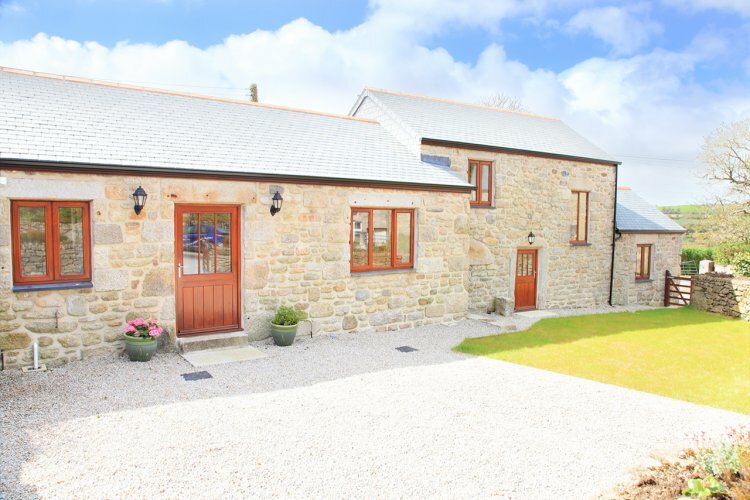 There is plenty of room to park, peaceful garden area and great access to all that this county has to offer, The Cottage is a relaxing location for a family to enjoy their holiday. The large, well-equipped kitchen and dining room has lots of light and space showing off the vaulted ceiling and exposed roof timbers. There is a dishwasher, fridge freezer, electric oven and separate 4-ring electric hob. The living room features a corner sofa and LCD TV while a log burner gives the warmth and comfort of a traditional cottage but with the modern touches including Wi-Fi. A door from the living room opens to the garden with a bench for catching the morning sun. On the ground floor there is a spacious shower room with large mixer shower, toilet and handbasin; a skylight fills the room with natural light. Also on the ground floor are two of the bedrooms, at one end of The Cottage a double room with large built-in wardrobes and at the other, a twin room with wardrobe and chest of drawers. On the first floor you will find another double room with large built-in wardrobe and cupboard. The family bathroom has a bath with mixer shower over, matching fitted toilet and handbasin and a heated towel rail. The Cottage is heated throughout by modern electric panel heaters with at least one in every room or a heated towel rail in the shower-room, bathroom and kitchen. Rental includes bedlinen, electricity, heating, towels and the first logs for the woodburner. Regret no smoking and no pets. Shower room with toilet and handbasin. Bedroom 1 with double bed and large built-in wardrobe. Kitchen and dining area with oven, 4-ring hob, fridge freezer and dishwasher. Dining for 6 persons. Five steps lead down to living room with corner sofa, TV and log burner. Bedroom 2 with twin beds, wardrobe and drawers. Bedroom 3 with double bed and built in wardrobe. Bathroom with bath with shower over, toilet and handbasin.